After 32 exhausting levels of play, Jordan Morgan was the player with all the chips, the top prize of $478,102, a shiny gold WSOP bracelet, and a big smile on his face. 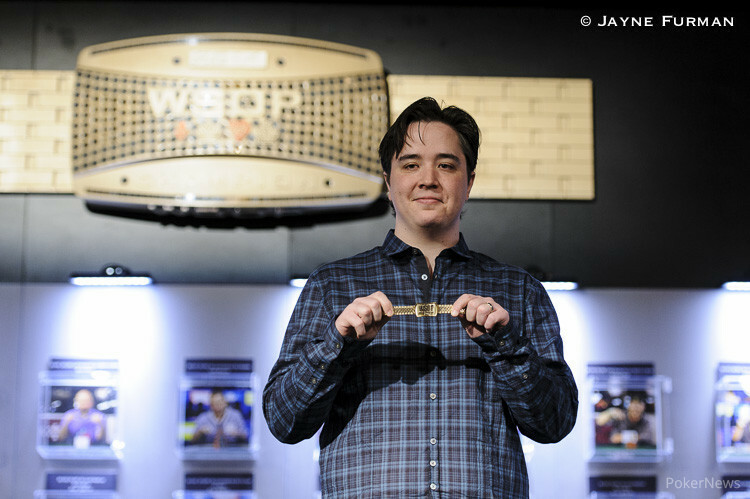 It took an extra day to get there, going to Day 4 in this three-day event, but Morgan eventually got the job done, and he added a gold bracelet to the gold WSOP Circuit ring he picked up in 2007. Heads-up play began on Day 3 in the early evening between Morgan and Evan McNiff. The two of them decided to call it a night nearly six hours later. When they returned on Tuesday for Day 4, it took a little over an hour to wrap it up. The first time these two players really tangled was when there were still five players in the tournament. McNiff raised to 80,000 from the cutoff and Morgan made the call in the big blind. The flop was and McNiff bet 90,000 after Morgan checked. Morgan called and the turn was added: . Morgan checked again and McNiff made it 245,000. Morgan called. The river card was the and Morgan led out for 425,000. McNiff pushed all in and Morgan called. Both players had made a full house, but Morgan's was better with the fives full. Morgan secured a massive double up and became the clear chip leader with more than half of the chips in play. The heads-up battle began with Morgan still holding a substantial chip lead. He had 6,863,000 chips on his side of the table compared to 1,750,000 for his opponent, but McNiff whittled away and was eventually in command of the majority of chips in play. At one point, Morgan was staring his elimination in the face when he got it in behind with the against McNiff’s . McNiff's rail cheered for the anticipated win and it was looking good through to the turn of a board. However, everything changed when Morgan spiked an ace on the river. The dealer flipped over the and McNiff's rail erupted with groans and shouts of "you've got to be kidding!" and "so sick!" When the two players returned for Day 4, they were very even in chips. Morgan had the small chip lead with 4,445,000 to McNiff’s 4,170,000. The two swapped the thin advantage a couple of times before the money went in. McNiff raised to 320,000 from the button and Morgan pushed all in. It was a sequence we had seen many times before in this tournament, but this time McNiff made the call to put his tournament life on the line. The two players flipped over their cards and revealed what is well-known in the poker world as a "classic race." Either way this hand went, it was going to be a game changer. Either McNiff was going to be eliminated or Morgan was going to be left short. The board ran out and McNiff saw his bracelet hopes slip away. Morgan's sixes held to give him the victory, and McNiff was eliminated in second place for a prize of $295,727. Thank you for following along with PokerNews and stay tuned for all the action throughout the rest of the 45th annual World Series of Poker. 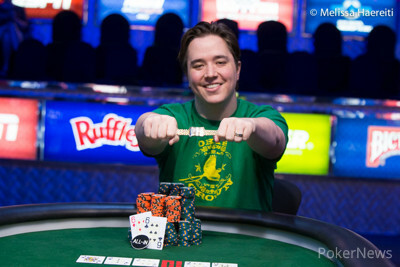 Congratulations once again to Jordan Morgan, the WSOP’s latest bracelet winner. 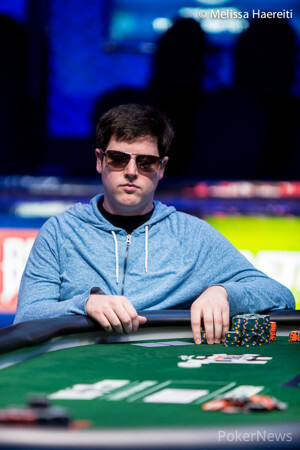 Hand #331: Evan McNiff raised to 320,000 from the button and Jordan Morgan pushed all in. It was a sequence we had seen many times before in this tournament, but this time McNiff made the call to put his tournament life on the line. The two players flipped over their cards and revealed what is well-known in the poker world as a "classic race." Either way this hand went, it was going to be a game changer. Either McNiff was going to be eliminated or Morgan was going to be left short. The board ran out and McNiff saw his bracelet hopes slip away. Morgan's sixes held to give him the victory, and McNiff was eliminated in second place for a prize of $295,727. Hand #326: Evan McNiff was given a walk. Hand #327: McNiff opened to 320,000 and Jordan Morgan tossed his cards away. Hand #328: McNiff got another walk. Hand #329: McNiff opened to 320,000 and Morgan made the call. The fell on the flop and Morgan check-folded to McNiff’s bet of 320,000. Hand #330: Morgan opened to 320,000 and McNiff didn’t like his hand. Hand #321: Evan McNiff opened for 320,000 and Jordan Morgan moved all in to take it down. Hand #322: Morgan gave up his hand on the button to give McNiff a walk. Hand #323: McNiff made it 320,000 to play and won the blinds and antes. Hand #324: Morgan raised to 320,000 and scooped up the pot. Hand #325: McNiff bumped it up to 320,000 and won the hand. Hand #316: Jordan Morgan opened to 320,000 and Evan McNiff folded. Hand #317: McNiff opened to 320,000 and Jordan Morgan opted for a better spot..
Hand #318: Morgan opened to 320,000 and McNiff let it go. Hand #319: Morgan got a walk. Hand #320: Morgan opened to 320,000, McNiff three-bet shoved, and Morgan folded. Hand #311: Evan McNiff allowed Jordan Morgan a walk when he folded his button. Hand #312: Morgan raised to 320,000, McNiff quickly pushed all in, and Morgan folded even quicker. Hand #313: Morgan was given another walk. Hand #314: McNiff was the one to receive a walk this time. Hand #315: McNiff opened for 320,000 and won the hand. Hand #306: Jordan Morgan opened to 320,000 and Evan McNiff folded. Hand #307: McNiff opened to 320,000 and Jordan Morgan folded. Hand #308: Morgan opened to 320,000 and McNiff let it go. Hand #309: McNiff opened to 320,000 and Morgan made the call. The flop was dealt and Morgan check-shoved a bet of 320,000 from McNiff, and McNiff folded. Hand #310: McNiff got a walk. Hand #301: Evan McNiff opened for 320,000 and Jordan Morgan made the call to go to a flop of . Morgan checked to McNiff who bet out 320,000 and won the hand. Hand #302: Morgan raised to 320,000 and McNiff announced "all in." Morgan considered it for a moment before folding his hand. Hand #303: Morgan was given a walk. Hand #304: Morgan bumped it up to 320,000 and won the blinds and antes. Hand #305: McNiff raised to 320,000 and Morgan quickly pushed all in. McNiff gave up his hand. Hand #296: Evan McNiff got a walk. Hand #297: McNiff opened to 320,000 and Jordan Morgan folded. Hand #298: Morgan opened to 320,000, McNiff three-bet to 645,000, Morgan four-bet to 1.2 million, and McNiff folded. Hand #300: Morgan opened to 320,000 and won the pot.